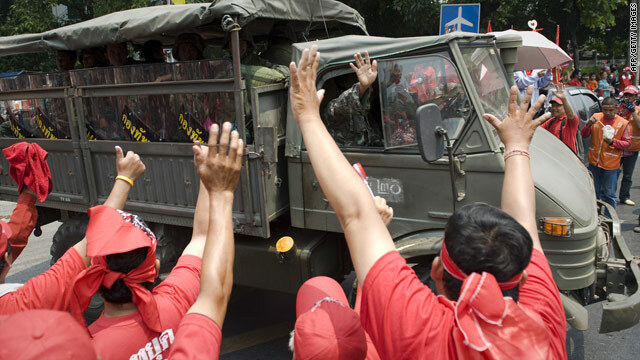 Red-shirted supporters of deposed PM Thaksin Shinawatra wave to soldiers as they leave the area in army trucks. Bangkok, Thailand (CNN) -- The Thai military is withdrawing its forces from parts of the country's capital to avoid potential confrontations with red-shirted anti-government protesters backing the ousted prime minister. The announcement came as an estimated 80,000 protesters held a demonstration in Bangkok Saturday, the latest mass rally staged by supporters of former prime minister Thaksin Shinawatra. They demand incumbent Abhisit Vejjajiva's government holds new elections. "In order to avoid undesirable incidents and confrontation with the demonstrators, the military commanders have therefore ordered the withdrawal of all military and police forces being previously stationed in the risk zones to be moved out and, instead, regrouped in the nearby vicinities," military spokesman Col. Sansern Kaewkamnerd said Saturday. "Military commanders have expressed their appreciation to all military and police personnel for their vigorous work and emphasized personnel to treat demonstrators with politeness, which will help reduce conditions that lead to clashes among the Thai people." Soldiers and police will remain on guard at specific locations, such as the Suvanabumi Airport and military compounds, and will continue to maintain public order in the Bangkok metropolitan area. Kaewkamnerd mentioned one violent incident -- the tossing of a grenade at an army-run TV station that wounded four people, including two military officers. Protesters, whose red shirts symbolize their movement, say Abhisit was not democratically elected and want him to dissolve parliament and call for new elections. Thaksin, the only Thai prime minister to serve a full term, remains hugely popular. He fled the country in 2008 while facing trial on corruption charges that he says were politically motivated.